So after the business flopped (details in the scrap room....) am now handling ewaste for a non-ferrous yard here in Las Vegas. The yard's buyer submitted a buyers thread here several days ago that hasn't shown up yet (hey admin thanks for your hard work and also please get to this!) and I'm not a manager nor buyer but between this and running my own shop as a feeder yard before have some insight into this side of the business. So what questions do you have about this kind of operation? We buy only from businesses for the most part including other scrapyards. We do some shredding on site. 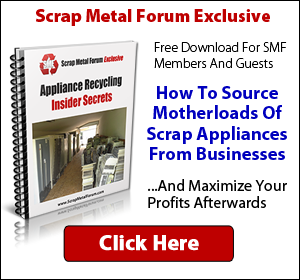 Some questions won't be able to answer for either lack of expertise or simply for business reasons (and some might post answers in the scrap room to encourage folks to buy memberships to support the forum!) but if I can answer certainly will. So ask away. Thank you and it will be interesting to get that perspective of the ewaste market. Good luck on your new position.